We pay high attention to detail, high quality, stylish, and user friendly products. At Ezzdo we realize that the core strength of Apple is their dedication to listening to the customer. An element our staff takes to heart as we strive to be the worlds best supplier of accessories to Apple's products. Ezzdo Choose good quality rhinestone Diamonds and Stainless Steel, butterfly buckle and Iwatch adapters, and even the gift Watch Case is also design elaborately. The band have 8links are removable, 4 links at each side with arrow mark, use link adjust tool, remove the pin from the ""arrow mark"" side to another side, after adjusted the size fix the pin back. At Ezzdo, we believe in our products. That's why we back them all with an 12-month warranty and provide friendly,easy-to-reach support. 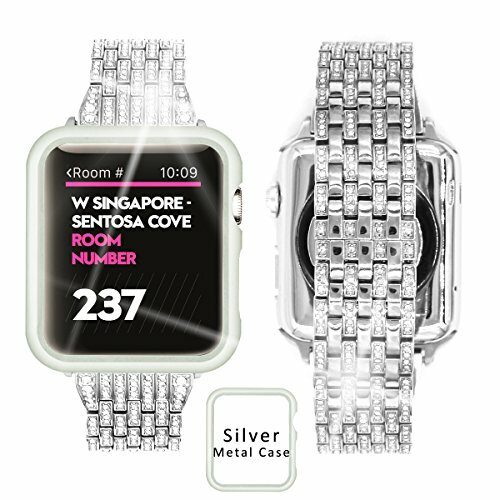 Perfect Replacement Band for Iwatch - Crafeted combination of rhinestone diamond and stainless steel, unique elegant and luxurious, perfectly dressed up at business, sport and daily. Silver Apple Watch Case - A silver aluminum iWatch Case included to make your watch color same with the band, and also protect the iwatch from scratching. Apple Watch Band Size - Fits Apple watch Series 1 Series 2 Series 3 sport & edition version 38mm. Designed for wrists 5 1/2inch-7 3/4 inch(143mm-200mm), 4 links are removable at each side, 8 links in total, package include a watch band link adjust tool. Upgrated Details - With butterfly buckle (Push Button), never fall off and conceal the buckle beneath, convenient to use; Iwatch adapters without screws, sturdy and durable. One year warranty - Includes a one year unconditional warranty for a refund or replacement. Lifetime customer service. If you have any questions about this product by Ezzdo, contact us by completing and submitting the form below. If you are looking for a specif part number, please include it with your message.